Cat parents are often puzzled by the question: How much should I feed my cat? 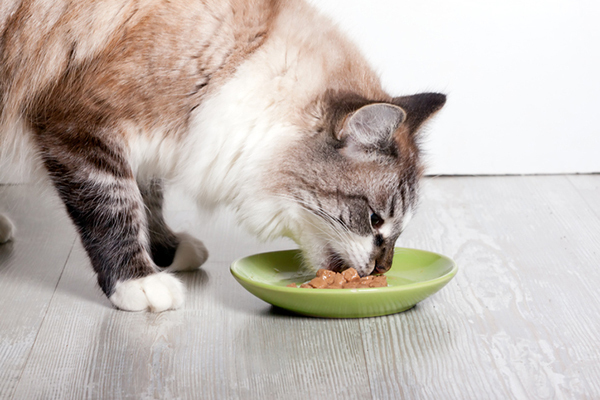 We unpack all you need to know about feeding your cat. If you’re a first-time cat owner, “How much should I feed my cat?” is likely to be one of your first questions when you bring your cat home. Even if you’ve owned cats for years, you may sometimes wonder whether your cats are getting too little food or too much. Let’s go through a few factors to consider when answering “How much should I feed my cat”? 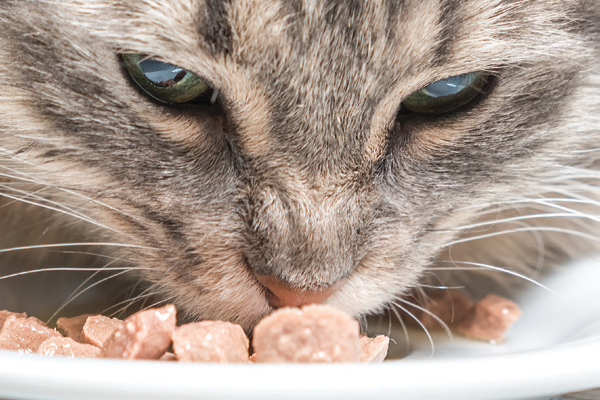 If you’ve ever wondered “How much should I feed my cat?” We’ve got the answers. Photography ©g215 | Thinkstock. The answer to “How much should I feed my cat” is based on many variables, including a cat’s weight and a cat’s age, whether you’re feeding wet cat food or dry cat food, the cat’s activity level, and whether or not she is pregnant or nursing. The brand of food you’re feeding also makes a difference when we’re answering the question “How much should I feed my cat.” A dense, high quality dry cat food will contain more nutrients by weight than a low-quality food, and thus require smaller portions to deliver the same amount of nutrition for your cat. Many cat owners allow their cats free access to dry food, supplemented by canned food once or twice a day. A dry-food-only diet is not necessarily a bad pet diet if you’re feeding high quality food, but it does require that you encourage your cat to drink a lot more water to compensate for what she’s not getting in canned food. When you bring a new cat home, it’s important to continue to feed her the same amount of the same food on the same schedule that’s she’s been accustomed to, then gradually migrate to your own food and schedule. Cats are very sensitive to change, and a new cat will be dealing with a lot of new-environment stress, so keeping the food and schedule consistent will ease her transition and keep intestinal upset at bay. When you’re ready to transition your cat over to your own food and schedule, you’ll need to determine what kind of food you’ll be feeding her (wet or dry, raw food or a combo), and using the calorie counts in each food, determine how much of which kind to feed her. 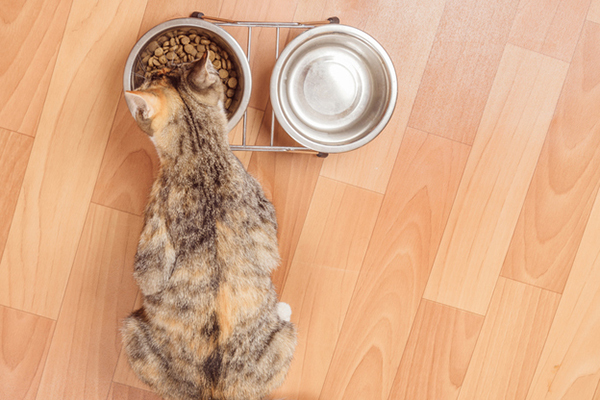 What to feed your cat — wet food or dry food? How much to feed a cat also depends on if you feed your cat wet or dry food. Photography by africa studio/shutterstock. Another important factor in answering “How much should I feed my cat?” is considering what you’re feeing your cat. The foundation of a healthy cat diet is flesh-based protein like meat, fish or poultry. 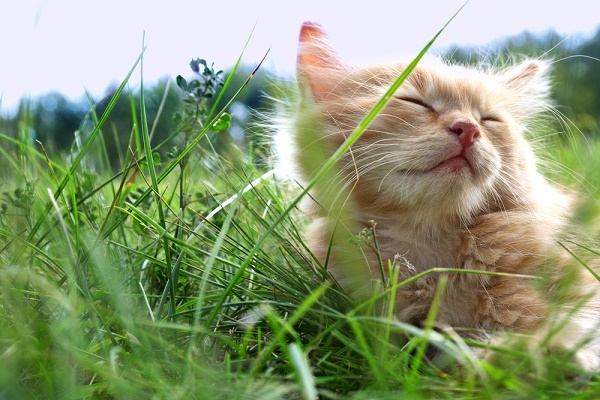 Dry food should be high in animal proteins, and low in plant proteins (which cats are ill-equipped to digest). Carbohydrates should make up no more than ten percent of the mix of cat food ingredients. Wet foods should consist predominantly of meat with as few by-products and fillers as possible. According to the Animal Medical Center in New York, a healthy, active 8-pound adult cat requires about 30 calories per pound per day. So, the average 8-pound cat requires about 240 calories per day. Typically, dry food contains about 300 calories per cup, and canned food contains about 250 calories in each 6 oz can. (or, 125 per 3-ounce can). Using these counts as a guide, an 8-pound cat would need 4/5 of a cup of dry food or just less than a full 6-oz can (or two 3-ounce cans) of wet food per day. You can adjust the proportions based on whether your cat prefers more or less dry or wet food. If you’re free feeding your cat dry food, each day measure out the day’s allotment of food into your dry food feeder. This decreases the amount of food that gets stale and needs to be discarded. It will also help you monitor how much your cats are eating. If you have to take a thin cat to the vet, it will help in the diagnosis if you can identify exactly how much she eats per day. Portioning out the food will keep your cats from overeating. Free choice feeding is one of the top contributors to feline obesity. Your cat’s feeding schedule is another thing to consider. Photography by Remains/Thinkstock. Another factor in determining “How much should I feed my cat” depends on how often you feed your cat. And how often to feed a cat depends on what you’re feeding her. Most cat owners feed their cats in the morning and at night, and may or may not supplement those feedings with free feeding of dry food throughout the day. 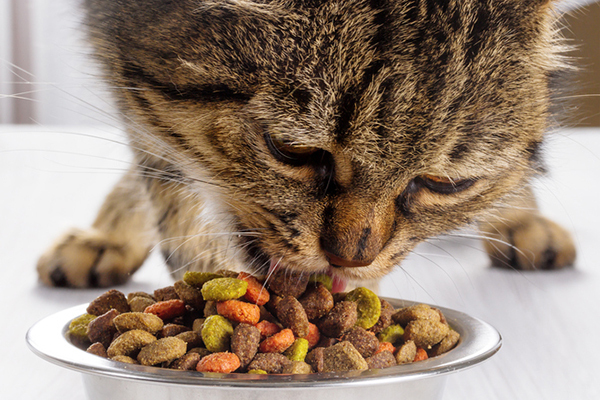 Is your cat eating enough — or too little? Throughout your cat’s life you will need to modify her diet to accommodate changing metabolism and dietary needs. Feel your cat’s backbone and ribs. If the ribs and backbone show through her skin, she is too thin. If you can’t feel the ribs, your cat is likely overweight. Adjust her portions accordingly. Keeping your cat from becoming obese is much easier than forcing an obese cat to diet. And it will make both you and your cat a lot happier. This piece was first published in 2009. Cat food goes stale? HAhahahahahahahahahahahahahahaha. you OBVIOUSLY have never had a cat! How about ground seaweed? It’s in the dry cat food I bought. It also has 4 meat products. They claim to boost the protein value in their food. Meow Mix has a lot of corn in it which breaks down into sugar, leading to diabetes in cats. If you want your cat to live longer, don’t feed him/her corn. You take your kids to McDonald’s every day?